Police stand guard outside the Time Warner Centre after an explosive device was found there. The first bomb was discovered Monday in a mailbox at the New York home of billionaire financier and Democratic Party supporter George Soros. 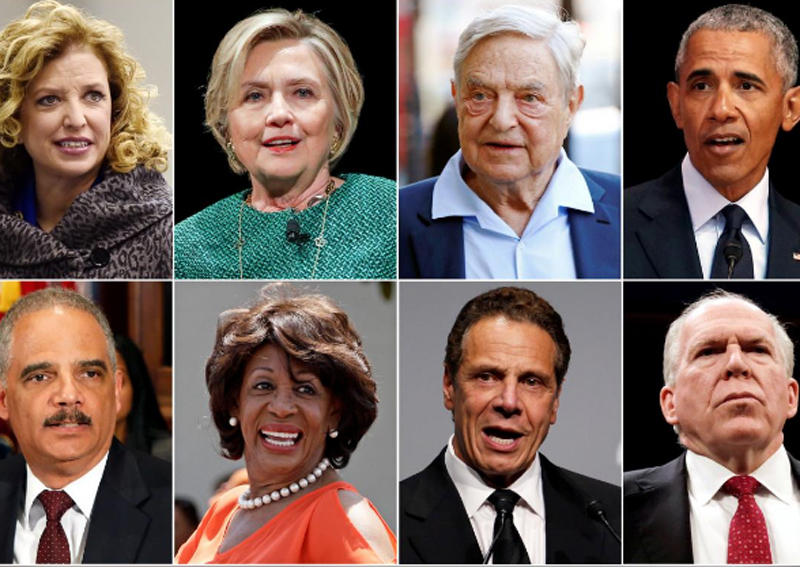 On Wednesday, explosive devices were addressed to the New York residence of former Democratic presidential candidate and secretary of state Hillary Clinton; the Washington residence of former Democratic president Barack Obama; California Democratic Representative Maxine Waters; and John Brennan, Obama's CIA director, sent via the New York offices of CNN, where Brennan is a regular contributor. Explosive devices were also sent to Eric Holder, the attorney-general under Obama and Democratic Congresswoman Debbie Wasserman Schultz, according to media reports. In addition, a suspicious package was sent to the Manhattan office of New York's Democratic governor Andrew Cuomo. WHAT WAS IN THE PACKAGES? The packages reportedly contained small, crude but potentially lethal pipe bombs: usually a metal water pipe filled with explosive material and shrapnel, tightly sealed at the ends and detonated by a fuse inserted through a hole. New York police commissioner James O'Neill described the one sent to Brennan at CNN as a appearing to be a "live explosive device." O'Neill said that package also contained an envelope of an unidentified white powder. In the case of Clinton and Obama, the US Secret Service said it identified the suspect packages during routine mail screening procedures it provides the former politicians in facilities separate from their homes. The packages "were immediately identified during routine mail screening procedures as potential explosive devices and were appropriately handled as such," the Secret Service said. The addressees "did not receive the packages nor were they at risk of receiving them," it said. In the case of the package to Holder, it never reached his Washington office because the address was apparently erroneous. Instead, it was sent to the return address used on at least two of the packages: the Florida office Wasserman Schultz. WHAT TIES THE TARGETS TOGETHER? The targets are all Democrats frequently attacked by Trump online and in speeches as he defends his 2016 election victory and policies he has implemented since coming to office in January 2017. Obama preceded him in the White House and Clinton was his 2016 election rival. Holder was attorney-general in the last years of the Obama administration. Trump has labelled CNN the leading purveyor of "fake news" against him, and Brennan is perhaps his most damaging critic from the national security community. Trump often ridicules Waters, a senior Democrat, as "low IQ" and has regularly attacked Wasserman Schultz, the former chairwoman of the Democratic National Committee, and Cuomo.